Serve cold with Ice cream or as it is. wow lovely... so so many fruits and nuts going.. must be a child's delight.. 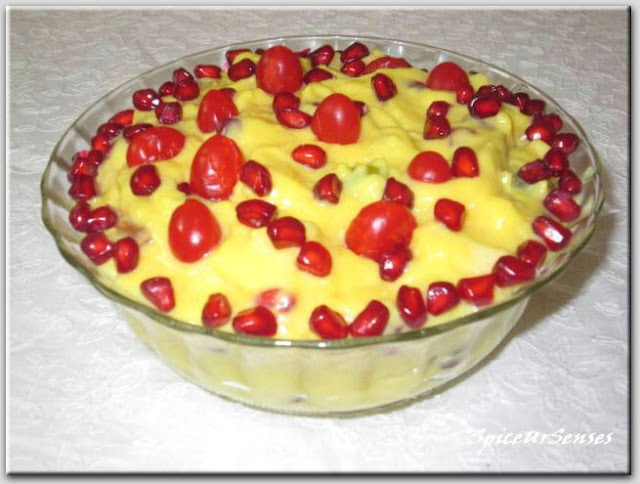 Cute looking and delicious fruit custard..
A bowl of fruit custard is a perfect way to finish the meal, looks very attractive. Love custard..Tempting picture..Thanks for sharing, Rumana.. Simple but lovely fruit custard. Am always a fan of custard...looks great.